There are not many names in the automobile industry as decorated as Audi. The German automaker has always been able to excel on a consistent basis and compete with some of the most credible heavyweights in the industry including Mercedes Benz, BMW and Jaguar. Another entry from the legendary automaker is the new Audi A4. The coupe is certainly a ravishing car that looks stunning from both inside and out. With the beautiful appearance and the powerful engine there also comes a hefty price tag. However customer can avail a used Audi car in the case the coupe is out of their budget. As far as the specs go, Audi A4 has got it all. So let us take a look as to how the coupe performs in different sections. As far as appearance goes, Audi was never a one to disappoint. The coupe features the signature four rings symbol on the front grill that accentuates the beautiful yet muscular front fascia of the car. There are strong character lines on the side while the rear portion is elegantly bold. As far as dimensions are concerned, Audi A4 comes with a height of 1427mm and a width of 1842mm. The distance between the wheels is 1572mm. Other stand out points about the exterior of the car includes modern looking LED rear lights with dynamic indicators, main beam and sculptured air intakes. We know that Audi is not going to leave any stone unturned when it comes to engine and fire power. Audi A4 is no exception as this bad boy has a powerful motor underneath which would serve well even for those who have garnered a used Audi A4. Under the hood, Audi A4 comes loaded with the 1.4 TFSI lightweight motor that has the ability to give away 150PS power and generate a maximum torque of 250Nm. This further equips the coupe to go from 0 to 100kmph in a matter of 8.5 seconds. Further if speed is what you crave for then will love to know that car can also crack a top speed of 210kmph. Audi A4 features a spectacular interior that comes with plush leather seats and marvelous upholstery that makes you want to never come out. As soon as you step into the car you get a sense of premium ambience which is exactly the kind of aura Audi was going for. Further the cabin is spacious where you can stretch your legs and sit back and enjoy the ride. It also helps that the interior is blessed with loads of multimedia features including Audi Sound system, electrically adjustable seat belts, MMI navigation system, Audi parking system plus with rearview camera, virtual cockpit, smartphone interface, Audi phone box and speech dialogue system. Drivers and passengers can use these features to interact with the vehicle make navigational choices and also stay entertained while in the back seat for long rides. You can sync your applications with the car for listening to movies and getting traffic updates as well. 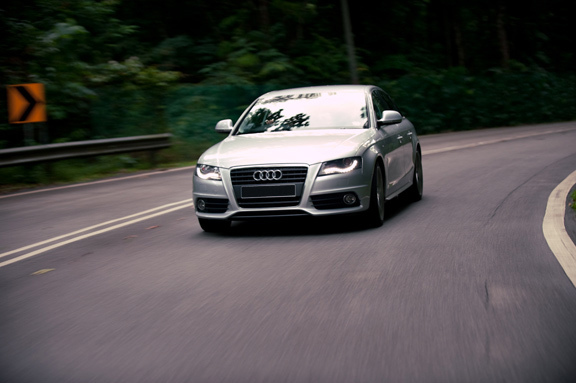 Audi cars have always maintained high standards when it comes to safety of their cars and passengers inside. Audi A4 is no different as the coupe features 8 airbags that protects the driver and passengers from impact from the front, side and the rear. The coupe offers a side airbags at the front, adaptive front end collision protection with seat position recognition technology a head airbag and rear side airbag. The coupe also comes with tyre pressure monitoring system that provides both visual and audio alarms and notifications to the system when loss of air pressure in the tires is detected. Other standard features crash sensor, door ajar warning and child safety locks are also present with the car.